Tokyo, March 5, 2013 – Fuji Heavy Industries Ltd. (FHI), the manufacturer of Subaru automobiles, unveiled the "SUBARU VIZIV CONCEPT" today at the 83rd Geneva International Motor Show (Press day: March 5 and 6; Open to the public from March 7 through 17 in Switzerland). 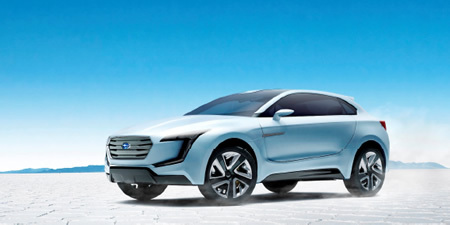 "SUBARU VIZIV CONCEPT" is a future-generation crossover concept that represents the new design direction and technologies that will take the Subaru brand into the future. "VIZIV" is a coined word inspired by the phrase "Vision for Innovation" to express Subaru's future vision of innovation and the future direction of the brand. The special site on the Subaru Global Site (http://www.subaru-global.com/ms2013/geneva/) will be updated with information relating to the Geneva International Motor Show. This will include images of the "SUBARU VIZIV CONCEPT" as well as a movie of Subaru's press conference. A future-generation crossover concept providing high efficiency and performance on all road surface conditions and driving environments has been created with a new Subaru design philosophy. The basic design features simple and clean surfaces and lines. The aim was to create the ideal balance between a solid-looking body and a condensed cabin. The front-end design boldly emphasizes the motifs common to Subaru products. The larger and outwardly projecting grille provides the keynote of the front-end design, and is the point from which the entire front end connects into a solid, dynamic design. The simple and powerful motifs of the sides create a new Subaru design element. The grand outward sweep of the integrated fenders and the solid door panel forms create a dynamic side view design. The upper cabin highlights the window graphics evocative of the shooting-brake body style. It contrasts with a solid body panel design, creating a sporty, lean silhouette. The rear design also features the same Subaru motifs used in the front. The rear combination lamp features an iconic Subaru motif, and the hexagonal panel surrounded by lamps projects outward in the center. The "Mistral Silver Metallic" exterior color highlights the dynamic, stylish exterior design of the "SUBARU VIZIV CONCEPT". Like the exterior, the interior invokes the promise of dynamic road performance. While great care was taken to design a highly refined environment, interior space was also designed to embody Subaru's renowned functionality, peace of mind and fun for all occupants. The cockpit features an instrument panel layout designed primarily for ease of driver operation and vehicle control. The instrument panel displays the operation status of Subaru's own driving assist "EyeSight" system. The tachometer and speedometer in the center combine functionality and sportiness, featuring a unique cylindrical design and outstanding visibility. Custom information displays in front of the front passenger seat and in the rear seating area let passengers share the thrill of being in the driver's seat. To implement Subaru's development concept of human-centered engineering, the two-door, four-seat stylish and sporty body was given a packaging design enabling four adults to ride comfortably even on long road trips. The 100% motor-driven rear wheels eliminate the need for a propeller shaft, creating a lower floor that offers ample legroom for rear seat occupants despite its compact size. "Subaru Boxer Diesel Hybrid", as a proposal to the future of Subaru power units, was mounted in the "SUBARU VIZIV CONCEPT". The powertrain is a plug-in hybrid system that combines a 2.0-litre Subaru Boxer diesel engine and high-torque-compatible Lineartronic (CVT) with a front motor that provides both vehicle drive and power generation, and two independent rear motors for vehicle drive only. By achieving solid environmental and road performance with this powertrain, Subaru's "Enjoyment and Peace of Mind" driving experience will be further advanced. The powertrain selects the best time to use each power unit according to its strengths and the driving application, achieving high fuel economy. The motors start and drive the vehicle during low-speed or city driving, while the diesel engine and high-efficiency Lineartronic take over on the highway. "Hybrid SI-DRIVE" system has an "Eco-Cruise" mode that provides coordinated control in conjunction with the "EyeSight" driving assistance system in addition to "Intelligent" and "Sports" modes. Engine and motor power are subjected to fine-tuned control according to the travel conditions captured and detected by the EyeSight's stereo camera, creating an intelligent driving feature designed for safety and environmental friendliness. "Independent-rear-motor-driven symmetrical AWD" system which is leading the way to a future generation of Subaru AWD technology has been adopted for the SUBARU VIZIV CONCEPT. Subaru is constantly refining its unique AWD systems according to the development philosophy "Four-wheel management". "Independent-rear-motor-driven symmetrical AWD" system provides fine-tuned control of the four wheels to match the travel environment and road surface conditions. Two motors exclusively developed for rear wheels' drive control the rear right and left drive power freely. Coordinated management system of the front and rear motor controls the division of drive power between the front and rear wheels. It increases Subaru's trademark active safety performance. Turning the steering wheel increases the drive power applied to the rear, creating a handling characteristic that responds nimbly to driver operations. Turning the steering wheel back increases the drive power applied to the front, creating a handling characteristic that emphasizes stability. In stop-and-go city traffic, all wheels are driven by the motors when starting from rest, providing high starting torque and powerful acceleration, but low fuel consumption with quiet ride. By independently controlling the drive power applied to the left and right rear wheels, the rear drive system provides more torque to the outside rear wheel and less to the inside rear wheel when cornering to generate inner-directed yaw momentum on the vehicle and achieve extremely quick and smooth "on-the-rail cornering". Besides helping acceleration and all-terrain performance, this groundbreaking AWD system also uses drive power to help turn the vehicle. Along with its thrilling handling and cornering that responds faithfully to driver operations, it also offers outstanding handling stability that ensures a high level of secure feeling and confident drive. Minimum turning radius can be compact due to "Independent-rear-motor-driven symmetrical AWD" system, thus superior maneuverability has been achieved.